To answer this question, let me give you the historical background of Microsoft prototyping tools and the motivation behind the new one. A few years ago, Microsoft Visio was our only choice for UI prototyping, however the outcomes of Visio for UI prototyping was very basic. More recently, Microsoft released Sketchflow which provides a quick way to prototype user interface scenarios. It has a far richer set of user controls for designing User Interfaces. The prototypes can also be designed using Silverlight or WPF, so that the final outcomes can then be directly used within actual WPF or Silverlight projects. Of course, this was perfectly OK for technical people but wasn’t the best choice for business users or people with limited technical skills (Business Analysts, Quality Teams, etc…). Microsoft heard the feedback of its customers loud and clear and it accordingly shipped a great and simple PowerPoint add-in with Visual Studio 2012 for prototyping. PowerPoint is familiar to almost every user who frequently uses Microsoft Office. 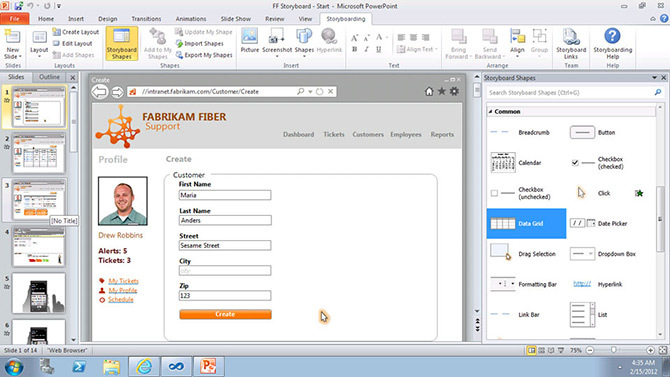 Unlike working with Sketchflow, which requires a separate application, every user’s machine will have Microsoft Office installed on their system thus making sharing these UI prototypes an easy task. SketchFlow is for building working prototypes of software for developers, while the new storyboarding capabilities allow business analysts or non-technical people to capture lightweight requirements from different stakeholders.